Beautiful penthouse apartment with jacuzzi 80 metres from the beach. Free Wifi. Private jacuzzi, big terrace, air con, wifi internet, lift, parking, pool. Beautiful penthouse apartment very close to Santa Ana beach. The apartment is very well and comfortably furnished and has a huge terrace with outside jacuzzi, barbecue, shower and summer kitchen. The apartment has air conditioning, heating and wifi internet. It is very comfortable and well equipped. There is a communal swimming pool ( open all year), gardens, lift and private parking. The apartment is close to bars, restaurants, shops and the marina, but is located in a quiet street. You can also visit Parque Palomo, SeaLife, Benalmadena Pueblo and Marbella. It is also possible to visit Granada, Seville, Cordoba, Gibralter and Ronda. You can also visit Morocco! The apartment is in Benalmadena Costa, which is to the west of Malaga and is 20 minutes by car or bus from the airport. It is 5 minutes walk to the beach and 10 minutes walk to the famous Marina, which has many international restaurants. You do not need to hire a car at this apartment. Benalmadena is a municipality of the province of Malaga, consisting of three main urban areas; Benalmadena Pueblo, Benalmadena Costa and Arroyo de la Miel. The city of Malaga is about 12 km to the west, with Marbella to the East. The area has grown rapidly in recent decades due to tourism and has become one of the Costa del Sol's prime locations. Benalmadena Costa is home to the majority of the areas attractions, the most important are the beautiful beaches.There are restaurants and bars to suit all tastes and the area retains a relaxed friendly atmosphere all year round. With such a wide and varied array of activities and things to do, any visitor will be never have a moment of boredom when visiting Benalmadena, a town which is truly more then just a resort. A promenade stretches along the coast to the Puerto Marina (Marine Port), which boasts excellent shopping and dining. The marina is also home to The Sea Life Centre, home to all types of marine wild life. You can take a stroll around to look at the floating hotels and millionaire’s yachts and at night the Puerto Marina becomes a party zone. La Paloma Park is a gorgeous location in the center of Benalmadena Costa. There is a stunning array of flora and fauna, plus a menagerie of animals including hens, rabbits, goats and exotic birds. The park is beautifully landscaped with themed gardens and rocky waterfalls, which run down to the lake. There are two bars within the park where you can relax into the evening listening to the calls of peacocks. Beside La Paloma park, you can visit Selwo Marina, the sister to Selwo Adventure Park. Modeled around different locations in South America, you can view close up dolphins, sea lions, crocodiles, exotic birds and snakes. Recently a penguin habitation has been installed giving a glimpse of the Antarctic in Andalucia. My name is Linda Coughlan and I, along with my colleagues, work for Comares Holiday Properties S.L. We rent and manage properties in the province of Andalucía. We think that this area, is the best area in Spain. Firstly, we have beautiful weather almost all year! But also we have lovely beach resorts, fabulous cities and stunning countryside. We work very hard to ensure that our clients have the best vacation possible and we have many clients who return each year. Come and discover Andalucía! There is one bathroom with bath and shower. Located in the outside summer kitchen. 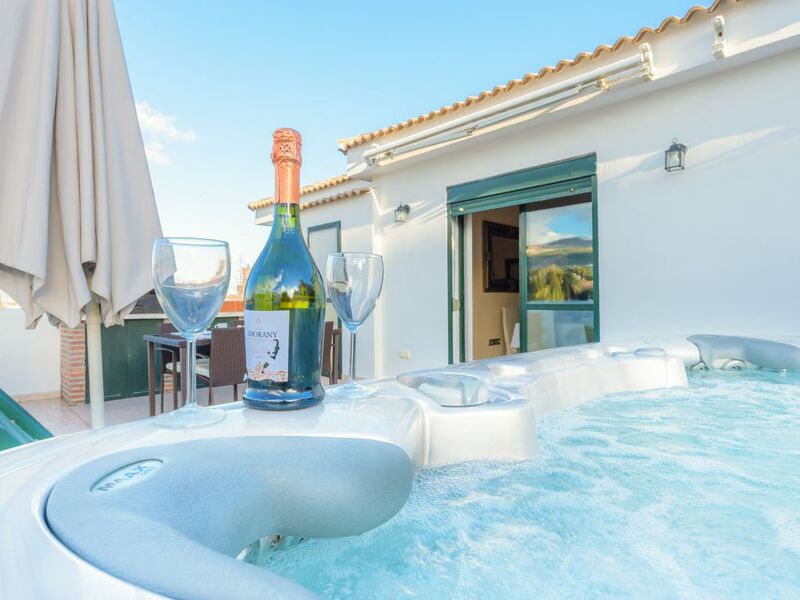 Very large terrace with barbecue, private jacuzzi, table and chairs and sunbeds. There is a lovely communal swimming pool in the gardens, open all year and there is no cost to use the swimming pool..
Baby beds and baby chairs can be provided. Please ask when you make your reservation. . Transfer from the airport to your apartment is available, please ask about this. From start to finish our holiday was made easy to enjoy by the friendly staff and the efficient way in which we where treated. We would not hesitate to return . Thank you very much for your kind comments and for being such a lovely guest. We hope that you come back in the future! Thank you for your kind comments and for being such lovely guests. The caretakers asked me to thank you. We hope that you return in the future. A beautiful apartment set back from the main shops and bars few minutes walk from the beach.which gives you the peace and quiet yet all the amenitys should you need them.hot tub and terrace is a massive bonus.will definitely be looking to come back soon. Thank you so much for your kind comments. We are very happy that you enjoyed your vacation and would certainly be happy to see you return in the future! Amazing accommodation, we arranged to be collected which worked well and then our bags were stored until the appt was ready. Everything we needed was in the appt, the air con worked well and the WiFi was brilliant. Great location just a short stroll from the beach, very easy access to shops, restaurants and buses. Thank you Judith so much for your kind comments. We certainly hope to see you all again in the future. The apartment was spotless, Sole was very helpful taking our luggage in as we had arrived early, allowing us to go for lunch and watch the Royal Wedding! Her brother provided the Airport transfers most efficiently. It was well set up for a family with lots of comfortable seating inside and on the terrace. The position is central to the Marina and sea front, shops & buses, there is a taxi rank in the road which was reasonably priced. The apartment was very comfortable, well equipped and quiet. Having a large private terrace with the hot tub was amazing! Great location for walks to the bars shops and restaurants. Would highly recommend. Thank you Ceri for your very kind comments. We would be very happy for you to return in the future you were very nice guests. The apartment is in Benalmadena Costa which is to the west of Malaga and is 20 minutes by car or bus from the airport. It is 2 minutes walk to the beach and 10 minutes walk to the famous Marina which has many international restaurants. From here it is easy to visit Granada, Ronda, Cordoba or Seville. You can also visit Morocco! You do not need to hire a car at this apartment. Airport transfers available, please ask. There is a late arrival fee for arrivals after midnight. This must be paid in cash, on arrival. Plese ask for the details. Clients who wish to smoke are asked to do ths on the terrace only. Additional services include airport transfers welcome packets beach towel rentals Please ask for the details. Il y a des frais d'arrivée tardive pour les arrivées après minuit. Cela doit être payé en espèces, à l'arrivée. Plese demande les détails. Les clients qui souhaitent fumer sont invités à le faire sur la terrasse seulement. Les services supplémentaires incluent transferts aéroport bienvenue aux paquets location de serviettes de plage S'il vous plaît demander les détails. Bei einer Ankunft nach Mitternacht fällt eine Gebühr für verspätete Ankunft an. Dies muss bei der Ankunft in bar bezahlt werden. Bitte fragen Sie nach den Details. Kunden, die rauchen möchten, werden gebeten, dies nur auf der Terrasse zu tun. Zusätzliche Dienstleistungen umfassen Flughafentransfer Willkommens-Pakete Verleih von Strandtüchern Bitte fragen Sie nach den Details. Er geldt een toeslag voor laat inchecken voor aankomsten na middernacht. Dit moet bij aankomst contant worden betaald. Plese vraagt ​​naar de details. Klanten die willen roken, worden gevraagd om dat alleen op het terras te doen. Aanvullende services omvatten luchthaventransfers welkomstpakketten verhuur strandlakens Vraag naar de details. Hay una tarifa de llegada tardía para llegadas después de la medianoche. Esto debe ser pagado en efectivo, a la llegada. Plese pregunta por los detalles. A los clientes que deseen fumar se les pide que hagan esto solo en la terraza. Servicios adicionales incluyen transbordos paquetes de bienvenida alquiler de toallas de playa Por favor, pregunte por los detalles.